We were greatly saddened today to hear of the sudden passing of our wonderful inspector during our 2017 season, Walla Abd el Moged Hussein. We remember her very fondly, and wish to express our heartfelt condolences to her family and colleagues. Walla was extremely kind and helpful, and especially loved to work with Diana to sort and identify the material coming from the excavations at the Industrial Site. We thank Walla for all of her assistance and friendship. We will never forget her, and she will be greatly missed. When we started work at the Palace two weeks ago, we had the workmen clean the walls that were going to be capped in the area of the King’s bedchamber and its antechamber at the southern end of the palace. In the process, they uncovered a section of fallen ceiling next to a wall in the southern half of the antechamber. Interestingly, the pattern of this ceiling is not the same as the fallen ceiling discovered in the northern half of the same room by the Metropolitan Museum in the winter of 1910-1911. Looking east at pieces of the cow ceiling lying on the floor at the northern end of the antechamber. The decorated wall plaster at the center left is the east jamb of the antechamber entrance. We know the exact location of the 1911 ceiling discovery because a photograph was taken of the fragments lying on the floor where they had fallen. (And yes, odd as it may seem, large numbers of the ceiling fragments were found lying face-up.) The pattern of this ceiling has a series of cows’ heads separated by spirals enclosing rosettes. At the time, it was possible to remove two large portions of this ceiling and set them in plaster. In the division of finds at the end of the year’s work, one section went to the Egyptian Museum in Cairo and the other was sent to New York where it is now on display in gallery 119 (11.151.451). Section of the cow ceiling that was given to the Museum in the division of finds in 1911. Rogers Fund, 1911 (11.215.451). The pattern uncovered two weeks ago consists of alternating red and blue concave squares with rosettes in the center. The lens-shaped spaces between the concave squares are painted yellow and have green circles at the intersections. A similar ceiling pattern was found by Waseda University in a room at the north end of the Palace during their excavations here in the 1970s (http://www.egyptpro.sci.waseda.ac.jp/e-mp.html). 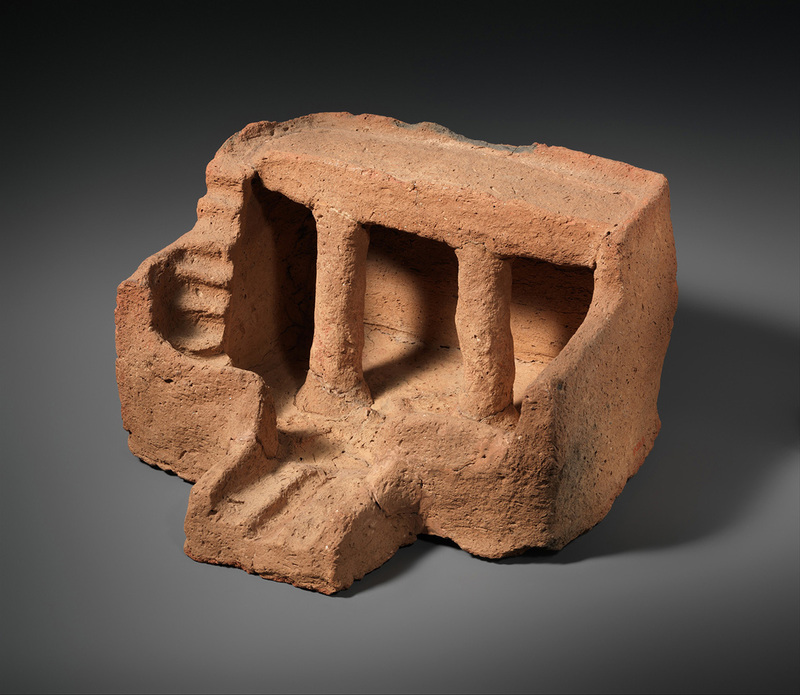 A ceiling fragment that was found while cleaning a wall in room J. This piece has the same pattern as the fallen ceiling, but was not found in situ. Anyone who has visited the nobles’ tombs at Qurna has probably noticed that the ceilings often have more than one pattern, and the same seems to have been true in the King’s Palace.